In those three days, guests will not only be able to shop but they can also attend helpful seminars and talks that are geared towards children's health, as well as security, safety, and of course education, and more. And while mommies and daddies sit and listen to these talks by professionals, the children can indulge themselves in kiddie activities that are not only fun but educational as well. Joyful learning! Moms who are into fashion will for sure have a blast with the Baby Fashion Weekend. It's the first in the country. Watch preggy moms, mom-daughter, dad-son, etc strut down the runway in stylish clothes made by the top designers and brands of the country. You can also witness the Sayaw Baby and Baby Olympics 2013 wherein parents can show off their nappy changing skills, Sandie Awards where celebrity families / entrepreneurs are featured and recognized through the Golden Family Awards, and ParentPreneur Awards. You can also see who will be crowned the #BibongBaby of the Year. Baby Expo Philippines 2013 is organized by MediaCom Solutions, Inc. - "Making Lives Better". It is co-presented by Cordlife, Asia Pacific’s largest network of private cord blood banks. 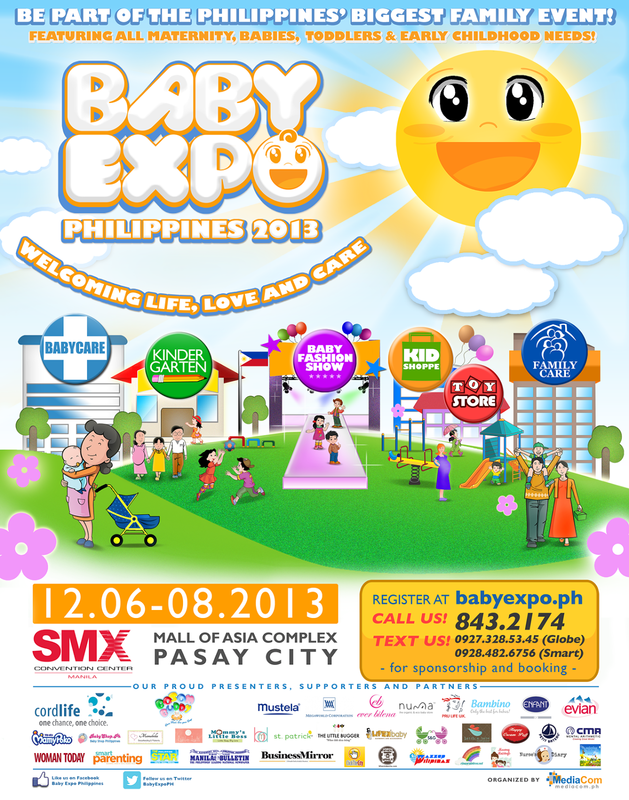 Baby Expo 2013 is giving away 1,200 worth of Enchanted Kingdom tickets to two lucky winners! All you need to do is follow the rafflecopter below! (The prize will be given on the event per se). Wow! Two males! Congratulations guys! :-) Please be reminded that you will be able to claim your prize from the Baby Expo Philippines Officials on on the event itself at Mall of Asia on December 6-8. If unable to claim sorry but I will need to pick a new winner. Please email me at rinasrainbow@gmail.com as soon as possible to coordinate. Thanks everyone! And thank you Baby Expo Philippines!!! Thanks for the giveaway po.